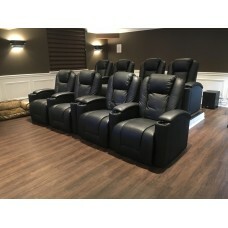 This 3 seat home theater seating set features TOP GRAIN LEATHER seats and arms with leather match down the back and sides. Optional *TOUCH SENSOR* Power Recline with Illuminated LED Cup holders pocket coil reclining seats are designed for comfort and style. Each padded arm has a cup holder that's sized to hold most cans, bottles and drink cups. Our wallhugger design lets you fully recline within inches of the wall. Quality Industry Leading Leggett and Platt Reclining Mechanism.